Early air cooled Porsche 911 engines and the later 964and 993 variants can be uprated and given a capacity increase by fitting larger cylinder barrels and matching pistons. 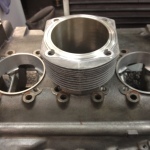 This conversion necessitates enlargement of the crankcase apertures which the cylinder liners fit into. At H T Howard we carry out this machining operation using our BERCO AC650M boring machine. The crankcases are mounted on parallels bolted to the machine bed and the first aperture to be machined is centred using the special stylus and dial indicator gauge built into the machine. The diameter of the locating spigot on the cylinder liner is measured and a small clearance allowance added to determine the final diameter of the bore required to accept the new liner. A specially shaped tool which allows for the cut to be made beyond the bottom of the machine column is selected. Using a dedicated setting micrometer, this tool is set to the size required and fitted to the boring head of the machine. 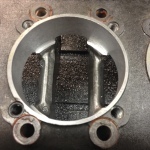 The crankcase is machined at this diameter and to a depth slightly greater than the liner spigot length to ensure that the liner cannot “bottom out” and prevent adequate sealing of the liner base gasket and the depth noted. 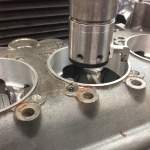 The new cylinder liner is trial fitted to the crankcase to check everything fits correctly and then the operation is repeated for each of the remaining liner housings ensuring that each is machined to exactly the same diameter and depth. 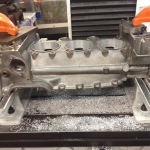 Once the first crankcase is complete it is removed and replaced on the machine with its opposing half. 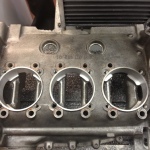 Each operation carried out again resulting in two perfectly matched engine cases.